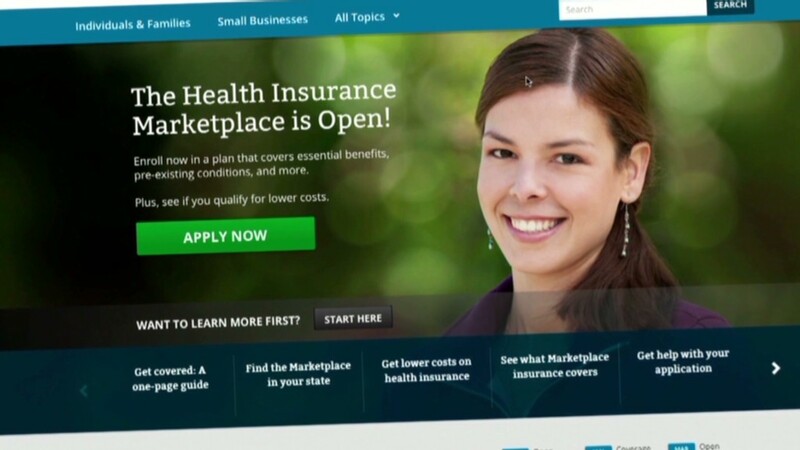 Young adults are buying Obamacare health insurance outside the state and federal exchanges. Enrollment on the Obamacare exchanges isn't the only number to watch. Lots of Americans are signing up for health insurance outside the exchanges -- plans that are not offered on the federal and state marketplaces. They are adding to the overall enrollment figures and bolstering the share of young adults, who are particularly coveted because they're considered healthier and less costly. That's important for determining Obamacare's overall success since exchange enrollment is falling short of some projections, and those signing up are skewing older than expected. For instance, some 40% of those buying policies in the fourth quarter through eHealth, an online comparison shopping site that offers off-exchange plans, were between age 18 and 34. But on the exchanges, only 25% of those who picked plans are in that age range. Not everyone realizes that insurers are continuing to sell individual policies outside the exchanges. Some insurers are offering a broader array of policies off the exchanges, while others are selling off-exchange plans only. The plans are subject to the same requirements as those offered through the Obamacare exchanges. But these policies are attracting many Americans who are not eligible for federal subsidies, which are available only through the exchanges. Though it's expected to be smaller than the state and federal exchanges, the off-exchange market is important because the two share a risk pool. And that common pool is what determines premiums for 2015. The off-exchange market has not received as much attention, in part because there's no central clearinghouse reporting enrollment and demographic figures. However, some insurers are providing a glimpse into who is signing up for coverage outside the exchanges. At Physicians Health Plan of Northern Indiana, nearly a quarter of people signing up are picking policies off the exchange. It offers eight HMO plans on and off the exchange, but an additional 11 options outside of it, including point-of-service plans that offer out-of-network coverage. 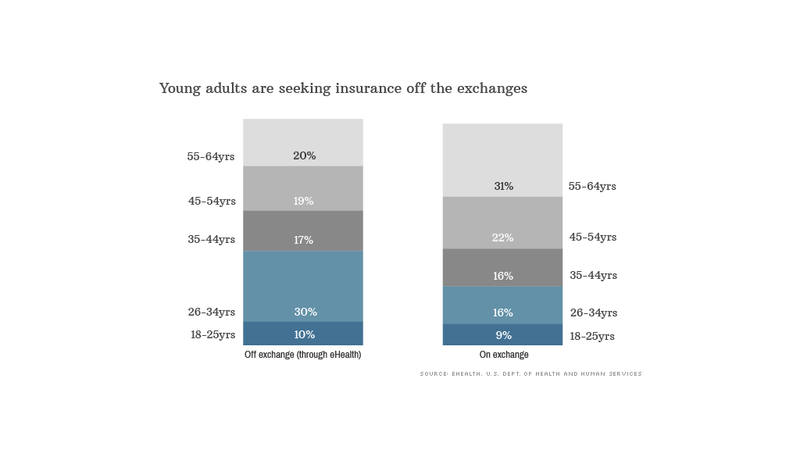 The average age of the off-exchange applicants is 38, while those coming through healthcare.gov are age 44, on average, said Jim Brunnemer, the insurer's chief financial officer. These off-exchange applicants are helping bring Physicians Health's overall enrollment age more in line with expectations, which it pegged at being in the upper 30s. "People need to keep off-exchange [enrollment] in mind," he said. "It's a single risk pool so we are looking at things in total." For Health First Insurance, the off-exchange market is particularly important because it serves Florida's Space Coast, which has the most engineers per capita in the nation. That means many potential enrollees don't qualify for subsidies, said Ed Griese, the insurer's chief executive. Some 40% of the insurer's 1,470 applicants picked plans outside the exchange. And 31% of those are under age 30, compared to 17% of exchange applicants. Meanwhile, many of the retirees in the area qualify for subsidies so 60% of exchange applicants are over age 50, while only 41% of those picking off-exchange policies are. So far, enrollment has been in line with projections, Griese said. Many younger Americans are selecting catastrophic plans -- available to those under 30 or who qualify for a hardship exemption -- off the exchanges because they cannot apply federal subsidies to them. Only 1% of those signing up on the exchanges picked a catastrophic plan, compared to 10% who selected them through eHealth, said Carrie McLean, director of customer service and retention.